VENTION HD to VGA Adapter provides an ideal way to connect laptop or desktop to VGA display, such as monitor, projrctor and TV. Support 1920×1080 resolution. Enjoy vivid and clear pictures. Aluminium alloy shell and molded exterior keep strong signal interference. Independent audio output. 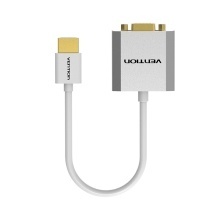 Solve the problem that VGA cannot transmit audio. The adapter has two modes. The first one is mirror mode that is suitable for sharing and presentation. The second one is extension mode that is good for work and entertainment. Applicable for laptop, PS4, smart box, projector, displayer and TV.